Conversely, the majority of complaints relating to the fence ‘not working’ can be attributed to incomplete or improper training. Contrary to what some people think you can’t just set up the fence, put the receiver collar on your dog, send them out into the yard and expect them to know what’s going on. Doing so will result in static corrections which could be prevented by appropriate training and these unnecessary static corrections lead to a whole lot of fear and confusion for your canine buddy. And that’s just plain unfair! The first thing that will happen is their collar will beep, reminding them to stop moving toward the fence boundary. If they ignore the warning beep the next thing that will happen is that metal prongs on their receiver collar will deliver a mild static correction. This electric stimulation won’t hurt them — it simply reminds them that they’re somewhere they shouldn’t be. To teach them that whenever they cross the unseen boundary there will be consequences. To help them understand that they can avoid the static correction by responding appropriately to the warning beep. What we’re going to do here is give you an overall view of the training process. At first glance it might seem like there’s a lot to it but based on the reviews we’ve read the average dog can be completely trained in about 2 weeks. That being said, your dog’s training may take more or less time depending on how they learn and how much time you have to devote to the training on a daily basis. For best results perform the training sessions frequently and keep them short. 10-15 minute sessions several times per day seem to work well for most dogs. 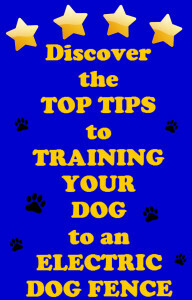 Keep your dog engaged and help them look forward to the training by making the sessions fun. 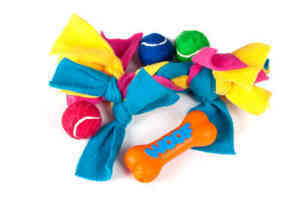 Use yummy treats to reward your pet for doing something right and don’t be afraid to lavish them with verbal praise. Put a positive spin on the training experience by starting and ending each session with some play time; including your four legged friend’s favorite toys will help jack things up a notch. Now that we’ve looked at some overall guidelines let’s dig into a bit more detail about the 5 phases of the training process. In the first phase your main goal is to get your dog accustomed to their new boundaries and here’s where all the items listed above come into play. Training flags: You’ll set the flags up around the perimeter of your dog’s containment area to give them a visual representation of where the fence line is. 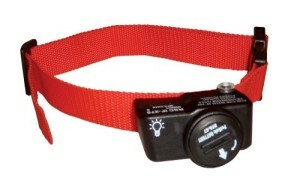 Non metallic collar: Because attaching a leash to the electronic collar can cause the metal prongs to exert undo pressure on your dog’s neck, a second collar is used so that you can attach the leash to it. The collar has to be non metallic so that it doesn’t interfere with the signal being communicated between your fence and the receiver collar. Leash: The leash allows you to be in complete control so that you can help your pet respond appropriately to their new boundaries. Electronic receiver collar: In addition to various levels of static correction the receiver collar is also equipped with a beep only training mode and this is the mode you’ll use when you first start the training. No static correction is used in phase one. 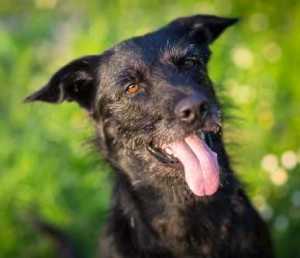 Using the electric stimulation too early can be confusing to your dog and may scare them. Not only are these things not good for your pet but they can also unnecessarily prolong the training time. The beep will serve as a warning to let your dog know that they’re getting too close to the boundary. 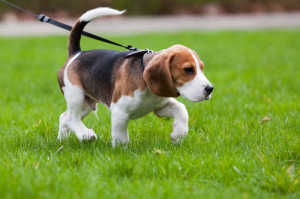 The leash will help you redirect them away from the flags when they hear the beep. When they get to a point where they’re turning around on their own every time they hear the beep, you’ll know that they’re familiar with their new boundaries and you can move on to phase two. Phase two will reinforce that your dog needs to respect the boundary and stay within the containment area. They’ll learn that if they don’t move away from the boundary and back into the yard when they hear the warning beep they’ll receive a static correction. When you first introduce your dog to the static correction it’s highly recommended that you start with the lowest level your collar offers and increase it only if you have to. Some dogs respond well at the lowest level while others need a higher level to make them comply. The mild electric stimulation your pet’s collar delivers is designed to remind them to stay within the preset boundaries, not to hurt them and most e-collars offer a range of static correction levels so that you can find just the right one for your dog’s temperament and size. As you go through the training your goal is end up on the lowest possible level that gets the results you’re looking for. Once your dog responds appropriately to the warning beep and avoids the static correction altogether you can move on to phase three. The goal of the third phase is to train your dog to stay within the boundary limits even when there are temptations and distractions outside the containment area. You can use whatever kind of temptation or distraction you want here — your dog’s favorite toy, a neighbor walking by with another dog — anything that you know would be really hard for your furry friend to resist. Once you’re satisfied that your dog won’t cross the boundary no matter what’s on the other side it’s time to move on to the next phase. In this phase you can remove the non metallic collar and dispense with the leash. The receiver collar stays on and now it’s time to see how well your dog does when they’re off leash and have full run of the containment area. Because this is the first time that they’ll be off leash since the beginning of the training it’s recommended that you stay outside with them and continue to keep a close eye on them at this point. Phase 5 is the final phase and you can move on to this phase when you’re comfortable with how your pet’s behaving off leash with close supervision. Although it’s still recommended that you monitor your dog in phase 5, you don’t need to be outside with them all the time — you can just check in on them every so often. It’s important to realize at this point that if your dog does cross the boundary for some reason it’s not the end of the world. You simply go back to the on leash training using the biggest temptations you can think of. When you’re convinced they won’t cross the fence line again you repeat phase 4 and 5. Once you’re confident your dog won’t cross the boundary no matter what, all your time and effort has paid off. The training is done and you can remove the boundary flags. One thing we want to mention here is this: Many people are apprehensive about the static correction and that’s completely understandable. The important thing to remember is that before you use any kind of electric stimulation you’ll teach your dog to associate the beeping of their collar with the end of the containment area. By doing this the warning beep will quickly become all the motivation they need to stop moving toward the fence line and stay within the predefined boundaries. And here’s the thing that sets our minds at ease: In their reviews of electric dog fences the vast majority of people said that once their dog was fully trained they were able to set the collar back onto the beep only mode because that’s all they needed to keep their dog in check! So if you follow the recommended training regime the only time your dog will receive static corrections is during the training process and even then they’ll be kept to a minimum. If you’d like to know more, you can head over to this article that explains why today’s electronic collars are safe and humane. Now that we’ve talked a bit about the static correction we want to answer one question that comes up a lot when talking about any type of electric dog fence: What’s the best way to take your dog out of the yard? Designate a spot that will become their ‘gate’ — an area they’ll cross over only with you and only when their receiver collar is off. Remove their receiver collar and replace it with a different collar. Failure to do so will result in them getting an unnecessary static correction when they leave the containment area. Now you’re ready to lead them out of the yard on a leash, carry them out or take them in the car. Going through this routine every time you take them out of the yard will reinforce that it’s OK to leave the containment area only with you and only when their receiver collar is off. So that’s the training process in a nutshell. If you’d rather watch the training in action you can check out the following PetSafe video. It mentions both wireless and in-ground fences because the training process is the same no matter what type of electric dog fence you end up with. 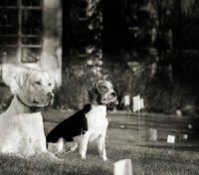 No matter what type of electric dog fence you have or what breed of dog you own, complete training is absolutely essential to the success of your system. It’s not a difficult process and yet many of the problems we read about in the reviews could have been avoided with proper training. So if you’re not willing to put some time and effort into training your dog you might want to consider another fencing option. But rest assured — for the relatively small amount of time it takes to properly train your dog, your reward will be a lifetime of safety and security for your canine buddy!